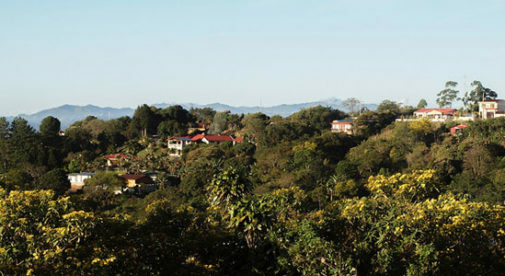 The Central Valley is a popular retirement destination in Costa Rica. Over 70% of Costa Rica’s population lives here. They are drawn to it by the superb quality of life that the Central Valley offers. Before I moved to the Central Valley, I had read about the area’s fabled year-round spring-like temperatures and I thought to myself, Yeah, right. Well, yeah—it turns out, they were right. Everyone has their own idea of what the perfect climate is, for me it is a daily range of 60 F to 80 F. That is the exact range I experience year-round where I live—eight miles up the mountain from the town of Grecia, at an elevation of 4,700 feet. The Central Valley is where most of Costa Rica’s produce comes from. Because of this, prices for fruits and vegetables are very low. It’s not just food that’s affordable either. Because the region isn’t overrun with tourists, real estate tends to be significantly cheaper than in the coastal regions. Also, because of the excellent climate, most homes don’t require heating or cooling, allowing for very low utility bills—ours usually runs about $40 a month. One of the criteria my wife and I had for where we wanted to live in Costa Rica was we had to have a view. By definition, if you live in a valley, you live surrounded by mountains. Not only do we have incredible vistas, but we get the accompanying wildlife as well. From volcanoes to wildlife, there’s plenty to see in Costa Rica’s Central Valley. The Central Valley is home to many exotic birds, mammals, and reptiles. Every morning where we live, several flocks of parrots and parakeets fly by, and occasionally we get a visit from a toucan or a laughing falcon. Also, scattered among the mountains are other wonders of nature. 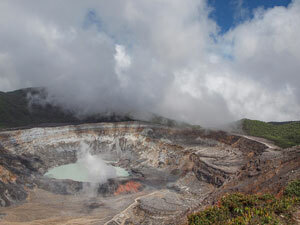 Two of Costa Rica’s active volcanoes (Poás and Irazú) are located in the valley and are popular tourist attractions. There are also too many waterfalls to count, including the country’s tallest. At over 300 feet tall, Catarata del Toro is a magnificent sight. It’s located in a dense forest just outside of the town of Sarchí, where it flows into an extinct volcano crater. There are so many things to do in the Central Valley that allows you experience the colorful Costa Rican culture. From the many fiestas, to taking in a concert or play at the National Theatre in San José, there is something here for everyone. There are two cultural experiences that I love. First is the annual pilgrimage to the basilica in Cartago. Over two million people walk to the church from many points throughout the country. The most popular route is to walk the 20 miles from the capital down the Pan American Highway to Cartago. The pilgrimage takes place every year, starting in late July and ending on August 2. My second favorite experience is the tope (horse parade). Similar to some events in an American rodeo, the tope is part of many fiestas. The two largest topes are in Palmares and San José, with more than one million spectators attending each event. The final thing that makes the quality of life in the Central Valley exceptional is its easy access to everything. As mentioned above, the valley is home to almost two-thirds of the country’s population. Therefore, resources are readily available to support the masses. The majority of towns in the Central Valley are less than an hour away from the capital city, San José. This close proximity allows for easy access to hospitals, cultural events, shopping, and more. The same holds true for the country’s busiest international airport in Alajuela. Services, such as internet, cell phone coverage, and cable are excellent and less expensive in the Central Valley compared to the rest of the country. Add all these advantages together and you come away with the Central Valley being the very best place for a higher quality of life in Costa Rica.